M T D F e b r u a r y 2 0 1 9 28 F i n d i n g T e c h n i c i a n s become more critical in the last three or four years." 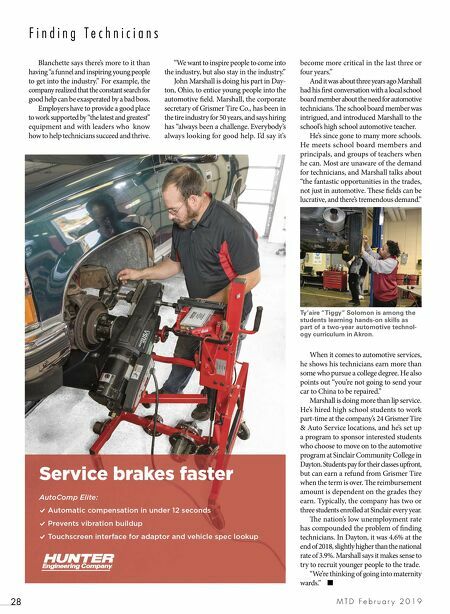 And it was about three years ago Marshall had his first conversation with a local school board member about the need for automotive technicians. e school board member was intrigued, and introduced Marshall to the school's high school automotive teacher. He's since gone to many more schools. He meets school board members and principals, and groups of teachers when he can. Most are unaware of the demand for technicians, and Marshall talks about "the fantastic opportunities in the trades, not just in automotive. ese fields can be lucrative, and there's tremendous demand." When it comes to automotive services, he shows his technicians earn more than some who pursue a college degree. He also points out "you're not going to send your car to China to be repaired." Marshall is doing more than lip service. He's hired high school students to work part-time at the company's 24 Grismer Tire & Auto Service locations, and he's set up a program to sponsor interested students who choose to move on to the automotive program at Sinclair Community College in Dayton. Students pay for their classes upfront, but can earn a refund from Grismer Tire when the term is over. e reimbursement amount is dependent on the grades they earn. Typically, the company has two or three students enrolled at Sinclair every year. e nation's low unemployment rate has compounded the problem of finding technicians. In Dayton, it was 4.6% at the end of 2018, slightly higher than the national rate of 3.9%. Marshall says it makes sense to try to recruit younger people to the trade. "We're thinking of going into maternity wards." ■ "We want to inspire people to come into the industry, but also stay in the industry." John Marshall is doing his part in Day- ton, Ohio, to entice young people into the automotive field. 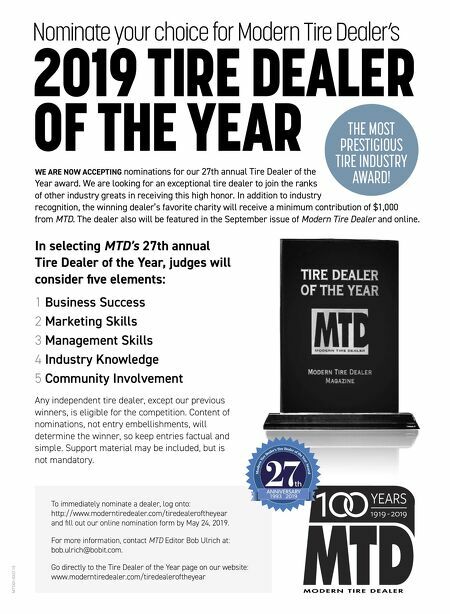 Marshall, the corporate secretary of Grismer Tire Co., has been in the tire industry for 50 years, and says hiring has "always been a challenge. Everybody's always looking for good help. I'd say it's Blanchette says there's more to it than having "a funnel and inspiring young people to get into the industry." For example, the company realized that the constant search for good help can be exasperated by a bad boss. Employers have to provide a good place to work supported by "the latest and greatest" equipment and with leaders who know how to help technicians succeed and thrive. Ty'aire "Tiggy" Solomon is among the students learning hands-on skills as part of a two-year automotive technol- ogy curriculum in Akron.